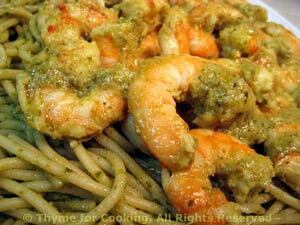 Pesto Shrimp over Pasta, Thyme for Cooking easy gourmet dinner. We may be well into fall but I thought one more taste of summer would be nice. If you still have lots of basil you can make the pesto; if not, just get a small jar or container. Served warm to bring out the flavors, the pesto works amazingly well with the shrimp, and the, more traditional, pasta. If you have to clean the shrimp add 10 - 15 minutes. You can use raw or cooked shrimp for this as the flavor is in the sauce rather than a marinade. Clean shrimp if needed, if not just rinse and let drain. Mix 2 tbs pesto, lemon and oil. Add shrimp and toss to coat. Heat a nonstick skillet over medium-high heat. Add shrimp and sauté for 3-5 minutes, until raw shrimp curl and turn opaque or cooked shrimp are heated through. Mix 1/3 cup pesto and oil. Add to pasta and toss well to coat. 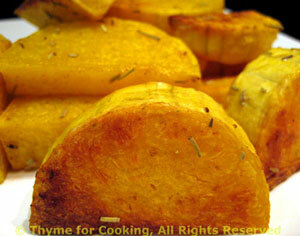 Arrange nicely on a platter or large plate. Lay the shrimp on top of the pasta and spoon any remaining sauce from the pan over the top.